Throughout my childhood, every December we went to Newcastle to see my mother’s best friend, Paddy. Paddy’s Christmas extravaganza was the highlight of my year! First, the pantomime (we once stumbled across the cast in a side-street restaurant… It was a bizarre combination of Linda Lusardi, Geoff Capes and Kenny Baker (at the time, Page-3 model, World’s Strongest Man and R2D2). From there, Fenwick’s Christmas Window (a MUST-SEE if you never have) and a local garden-centre decorated like Lapland but in Gosforth! Paddy bought armfuls of decorations there every year; my parents bought my sister and me one decoration each because they couldn’t afford more than that. That was where I fell in love with the most beautiful Christmas tree I have ever seen; an 8ft tree with branches right to the floor. I begged to take it home with us, but no, our living room was too small. Two years later when we moved to a house in Carlisle with 12ft ceilings, I asked again! Again, it was denied; they just couldn’t afford a new tree. The following year (aged 13) that 8ft tree was all I wanted for Christmas. Mum gave Dad one of “those looks” and the tree was mine; on the condition I decorated it from then on! That tree and our growing collection of decorations were a perfect match and my sister and I have added decorations ourselves over the years. None of them match; there are no coordinated sets of baubles and no “theme”; some are cute, some are beautiful and some are downright bizarre! She later moved to Maryland and we road-tripped coast to coast collecting a haul of decorations en route: a sleigh bell from San Francisco, Santa in a reindeer rubber ring from San Diego, a “Get your kicks on Route 66” decoration from Arizona and a pottery camel made by the Mescalero Apache Tribe in New Mexico. On arriving in Maryland she sent home our most grotesque decoration: a crab-shell painted like Santa’s face! In January 2005, only hours after taking the tree down, a flood hit Carlisle. We scooped the decorations up in a blanket and hauled them upstairs. My tree was lost, but the decorations survived. When the house was refurbished, I chose another tree which graced my parents’ living room for a decade, but only days after putting it up last year, a second flood hit Carlisle and that tree was lost too! As the water poured into their street, my parents stripped the tree of the decorations and saved them again. It sounds unlucky but earlier that year Dad decided to store the decorations in his workshop rather than back in the attic. If the tree had not been up when the flood hit, the decorations would’ve all been lost too. They are all the more precious now having survived when everything else did not. Our tree represents our family history; where we’ve been, what we’ve done and the friends we’ve had. My parents’ frugality produced an extraordinary collection that I would totally recommend gathering for yourself. My mother even uses it to store sentimental things which have no obvious place to live. Since retiring from Nursing, she volunteers in a school and when one little girl recently left, she thanked Mum by giving her a necklace with a big elephant pendant. As Mum doesn’t wear necklaces she wasn’t sure what to do with this little gift, but exchanging the chain with a ribbon solved the problem. This year the elephant has been added to the tree. Cheap or expensive, ugly or beautiful, they all have a place. The collection has become an heirloom in our family and one day my sister and I will divide them between us to keep the memories alive…. She can definitely have the crab! Dr Catherine Nesbitt is a Clinical Psychologist in the Child and Adolescent Clinical Psychology Service at NHS Dumfries and Galloway. 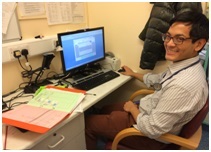 I recently started as the new Patient Feedback Manager for NHS Dumfries and Galloway. Just as I was settling in to my new role, life popped a little bump in the road and I found myself rushing through the doors of A&E one Friday morning with my poorly toddler. After a number of tests and assessments we found ourselves on Ward 15 for the weekend. I’m usually a reasonably laid back parent and when the kids get unwell, I generally believe in ‘keeping it til it gets better’, but watching my baby girl lie listless in my arms stirred up something almost primal in me. I needed to protect her and I needed to do whatever I could to get her better. Of course, this was paired with the realisation that I alone couldn’t fix this and that we were almost entirely reliant on the doctors and nurses. So there I was, anxious, frustrated, frightened and feeling more than a little helpless. Feelings I am sure many of you have experienced in similar situations. Later that weekend, as things began to calm, I took some time to reflect. Whilst the treatment we were receiving was of course important, the key thing that was making our experience so positive was the kindness; the gentle tones, the sweet smiles directed at my daughter, the hand placed on my shoulder when I was particularly worried and most of all, the fact that those looking after us genuinely cared. I thought about how I had felt when I first arrived at A&E and how determined I was to ensure that my daughter received urgent help. I imagined how I would have felt if the care had been different. What if the kindness hadn’t been there? What if I was dismissed as an over anxious mother? What if somehow they missed something or didn’t give us the right treatment? I can see how any one of those scenarios could occur and after many years working in the public sector I can also understand how sometimes, there are justifiable reasons for such. As patients and family members we often don’t know what the doctors and nurses are facing. It’s difficult to fully comprehend the overwhelming task they face each and every day with limited resources, conflicting demands and huge, often unpredictable, pressures. We must remember too that they are juggling all of this alongside their own lives, challenges and all. Whilst sitting here on the other side of this experience it is easy for me to apply that logic and understanding, it would however have been very different had any of those things happened when I was actually in that moment, dealing with those big emotions. It can be thoroughly unpleasant when someone complains about you. Even more so if you feel that it is unfair or unjustified. We must appreciate however that it is often about perception. The view from every angle is slightly different. We must too remember that nothing occurs in isolation. Just as a complainant may not know what you are facing that day, you may not know their story. Someone once told me that people shout because they feel they are not being listened to. The anger we sometimes see from complainants often stems from fear or frustration. The same emotions that can make us defensive or even dismissive, when we are on the receiving end of that anger. If we approach complaints from a position of empathy and with a genuine desire to learn and improve, we will go a long way towards reaching more positive resolutions. Until recently, different parts of the public sector had different approaches to dealing with complaints. This meant that patients, service users and customers were facing challenges negotiating the different procedures which, on top of an existing complaint, often escalated their frustration. Staff were also unclear about how to deal with complaints which led to a further variety of approaches. This issue was identified by the Scottish Government a number of years ago and as a result they have been working towards a standardised approach to complaints handling across the public sector in Scotland. The Scottish Public Services Ombudsman (SPSO) has led on this work, already delivering a model Complaints Handling Procedure to local authorities which they implemented in 2013. They are now working with the NHS to help us to implement a very similar procedure from 1 April 2017 and it is a key part of my role to support NHS Dumfries and Galloway with that task. 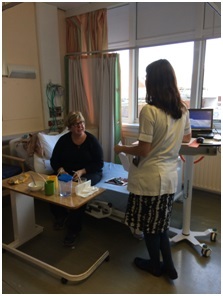 I know my NHS colleagues care deeply about their patients and the experience they have during their time with us. It is however a little more challenging to try to ignite that same passion about legislation, process and statutory timescales. We all know they are crucially important, but colleagues generally just want to get on with the job they are here to do, which is caring for people. It’s my job to help them understand that these changes will make everyone’s lives a little easier. It will ensure we have a clear procedure and a consistent approach to dealing with complaints. It will also ensure that we are offering the best support we can to those that wish to provide us with their feedback. This will help them to tell us their story and will better assist us in our quest to deliver the best possible care to those in need. Something we are all committed to. Emma Murphy is the Patient Feedback Manager at NHS Dumfries and Galloway. Have you ever pondered why this question is asked so frequently? The lifecycle of a hospital discharge prescription is rather complex, hopefully I am going to highlight the current process, and why it matters for everyone to be mindful of it in order to help improve it. • Amendments are required in 75% of DGRI prescriptions by the prescriber for various reasons e.g. Wrong inhaler device selected, interacting medicine, out of stock medicine prescribed, incorrect legal requirements documented, non-formulary medicine started with no documented rationale, patient requests an alternative medicine, medicine missing from the discharge prescription that the patient was previously on. This percentage just highlights the complexity of the process and does not reflect lazy doctors. Average time 15 minutes. Prescription is dispenesed then accuracy checked, relevant medicines are supplied, labelled and any pharmacy stock returned by a pharmacy technician. 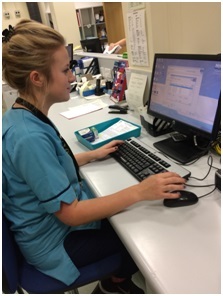 It is then accuracy checked by a different staff member, usually a checking pharmacy technician, before the patient copies of the discharge prescription are printed and an electronic copy is emailed to their GP. Note the dispensary also produces prescriptions for other areas such as out patient clinics, peripheral hospitals, prelabelled ward medicine packs, controlled drug orders, therefore there is often an invisible workload already there. Average time 60 minutes. Are you still awake? Me neither! So on an average day it takes around 2-3 hours from when a patient has been told that they are going to home, to their prescription being ready, and that is only if we get each of the 8 steps correct. In practice, there is usually a delay in one or more of the steps which can be very frustrating for the whole team and the patient. The exact point of the delay varies each time due to external factors such as staffing levels, the POD system not working, no designated prescription porter service, a high number of patients admitted, complex polypharmacy, high risk medicines, poor documentation or planning. We do have quicker variations of the above cycle,but only for patients deemed to be at a lower risk of medication errors, such as arranged admissions where prelabelled medicine packs are available for nurses to dispense straight from the ward for simple medicine regimes, such as painkillers. The most crucial part of the whole process, I would argue, is talking to the patient. It is well documented that 50% of patients do not take their medicines as prescribed, for various reasons, perhaps lack of understanding, their regime is too complex or they get unbearable side effects. Up to 10% of hospital admissions are due to medicines, again perhaps due to side effects or treatment failure by not taking the correct regime. The most common medical intervention in hospital is to prescribe or alter a medicine. We also know that 25% of medicine reconciliation lists are incorrect on admission and 75% of discharge prescriptions require amendments. Our current I.T systems are very useful in isolation, but information often must be copied from one system to another making mistakes easy and slowing us down significantly. Here in lies the problem; the communication of what a patient was taking when they came into hospital, verses any changes made during their hospital stay is not always fully documented, especially for patients already on several medicines (polypharmacy). Medicines are poisons when not used correctly or with extreme care. Why does it matter if we get a few medicines wrong or miss off their bisoprolol 2.5mg daily, who cares? I want my prescription now and I want to get home! • From this week, investment has enabled the triaging service for emergency admissions to be extended to 7 days a week, this will improve the number of patients seen on admission by the pharmacy team (currently only 10% with a weekday service) to allow any medicine related issues to be identified earlier. Discharge times matter to us all. So what can you do the improve this? • Follow the national medicine reconciliation process when clerking in, if you do not carefully check what medicines a patient is actually taking on admission, this will cause delays in their discharge when the junior doctor is trying compare the admission and discharge medicine list for any changes. • If you are reviewing a patient, look at the medicine reconciliation list, if there is not a clear plan documented for each medicine, challenge it and ensure someone reviews it. It will soon become common practice not to ignore any lists which do not include a dose or a plan. • If you prescribe a medicine, document an indication, plan and review date. Never assume that it is obvious, telepathy is not a skill! Everyone has different knowledge. • Also think about ‘realistic medicine’, could you manage to take the regime that you have just prescribed? • Listen to patients during a medicine administration round, if they think something is wrong, please check as we are all human and errors happen. • If you are a patient, please ask at every opportunity, what medicines you are being given and why. It matters to all of us that there is a clear rationale and plan for everything. I apologise that the blog today was not an easy read, but if you have any further ideas for improvement then please contact us at dg.pharmacydept@nhs.net. For me, a Londoner, Scotland is a magical place where I can breathe more deeply, every inch of the country is beautiful, and people are fairer, more concerned about each other, less materialistic, more romantic, musical, and poetic, and infused with a Scottishness that has a reality and intensity that Englishness lacks. My wife, a Scot, is not convinced. My first visit to Scotland lasted half a day. I was 16 in 1968 and had finished walking a corrupted version of the Pennine Way. We finished at Riccarton Junction (not Kirk Yetholm where we should have ended) and took the train to Hawick, where, perhaps because we were wearing shorts, somebody shouted “bloody Germans” at us. That railway closed a year or two later, but, as somebody who always prefers trains to planes, I was excited to travel a few months ago on the new Border railway from Tweedbank to Edinburgh. This illustrated for me how Scotland, the home of the Enlightenment, has a continuing capacity to reinvent itself. My next visit to Scotland was in 1970 to start at medical school in Edinburgh. I can remember now walking from Waverley Station to the University halls of residence at the foot of Arthur’s Seat and being slightly shocked by the black buildings but intoxicated with the thought of what might be. Edinburgh is the city of my youth. I know it better than I know London, where I’ve lived most of my life, and every street carries a memory of an encounter, an insight, a party, a tryst, or an awakening. I arrived at 18 and left at 25; I’ve been back many times since, almost every year, but those seven years remain as a sealed repository of the sweetest years when life was newer and more intense than now. In Edinburgh I was surrounded by poets. Many friends–Brian McCabe, Ron Butlin, Dilys Rose, Liz Lockhead, and Andrew Greig–were and still are poets, and as president of the University Poetry Society (nothing grand, I can assure you) I met Hugh MacDiarmid, Robert Garioch, Norman MacCaig, and Sorley MacLean, poets I read now in 20th century anthologies. I remember Sorley MacLean reading in Gaelic as if in pain and then reading English versions translated by others. During my first four summers as a student I cycled to Vienna, picked tobacco in Canada, took the Hippy Trail to India, and travelled overland from Nairobi to Lusaka to do an elective, but the fifth summer was the most exciting–when I abandoned neurosurgery as a lost cause for me (a correct judgement) and immersed myself for a week in the Edinburgh Festival and Fringe. I still love the hurricane of creativity that is Edinburgh in August, and it was in 1977 that I saw my brother, Arthur Smith, when he first performed on the Fringe. There were four of us in the audience (my future wife, two friends of my brother, and me) and five onstage, and as the show included audience participation there were soon nine of us onstage and nobody in the audience. But the National Review Company (as they were pretentiously and possible illegally called) became one of the most popular acts on the Fringe, and my brother, who has been almost every year since 1977, has become a Fringe Legend and a National Treasure. But perhaps the mountains were the most special thing. My first Hogmanay I travelled to Inverness to stay with friends, first-footed all night, and fell asleep on a concrete floor. They were train enthusiasts, and we took the train to the Kyle of Lochalsh, from where I saw Skye for the first time. We stopped and drank whisky in Achnasheen, or was it Achnashellach? One February I travelled to Ben Nevis with the mountaineering club and marvelled at the two leaders whistling Haydn sonatas to each other all the way from Edinburgh and then leaving the coach to bivouac on the mountain. The next day we climbed the North Face of Ben Nevis with ice axes, and one of our party, an American, fell to his death. Another time I travelled to Caithness and felt further away from London than any place I have been since, including New Zealand, China, Chile, Zambia, and some 50 other countries. And then there was the medicine. I applied to Edinburgh because in 1969 people would tell you it was “the best medical school.” But it wasn’t. I loved Professor Romanes producing exquisite chalk drawings to show fetal development, and I remember the first cut on our corpse–when I pressed too hard and put the scalpel into the dead woman’s heart. The course felt “anti-intellectual” to me, and we had an aborted revolution in my fifth year. Some of my teachers had a great influence on me, but my defining moment was listening to Ivan Illich argue that “modern medicine is the major threat to health in the world today.” That experience in an Edinburgh January blew me of course medically, and it always strikes me as ironic that it should have led to me becoming editor of the BMJ, a position in the medical establishment whatever I may have thought. I tell these tales to try and illustrate why Scotland has come to have such a special place in my heart and to feel so different, so much more magical, than England. Once while staying in Edinburgh one summer I had to attend a funeral in Hertfordshire. I took the train down and back, and as I came close to Edinburgh with the Firth of Forth lit by the last of the day’s light I was sure that I was living at the end of the East Coast Line. In the May before the referendum on Scottish independence I walked the South West Coastal Path with friends from Edinburgh and the Borders. They were divided on what to vote. I had no vote, but I feel sure–for emotional not political–reasons that one day Scotland will again be independent. It is a different and better country than the rest of the UK. My only hope is that I won’t need a passport to visit. Richard Smith is a doctor, writer and businessman. he is a former editor of the BMJ.